You can still find deliciousness when even the air tastes bad. If you haven’t packed a meal or snack for your flight, keep these tips from Eat More Better in mind. • As is generally the case with prepackaged, highly processed foods, saucy pasta dishes fare better than large pieces of meat. • The kosher option is recommended, because the meat will be marginally higher in quality and specialty meals are often served first. Vegetarian meals are another good way to get food sooner while avoiding questionable meat. • Never order fish. Fish lives below sea level. You’re five miles above ground. Fish are meant to move horizontally, which means they can be transported across land to your plate. But they should never be eaten that high above their home. (By contrast, I’ve wondered whether birds would be more delicious on airplanes, because you’re already so close to their natural habitat. Perhaps aircraft could be equipped with nets, not unlike fishing trawlers, and airplane food could be harvested in flight. • Use your butter. Use it all. Ask for more. It’s intended for the roll, but you can add it to rice, pasta, meat, or all of the above. • If the meal includes a wedge of cheese, put it inside the roll to form a sandwich, then add butter and entrée sauce as condiments. • If you’re having breakfast on an international flight, know that few foods suffer more from precooking and reheating than eggs. They look and taste like the only food left for humanity in a dystopian future. Stick with cereal, fruit, or muffins. • Experiment and take risks. After all, by putting any of that food in your mouth, you’ve already taken a risk. Shrewd investors aren’t afraid to double down. • Whether ordering soda or juice, always (politely) ask for the whole can. You may even ask for a second, unopened can to save for later, thus creating what economists call a surplus. Or get a can of juice and a can of sparkling water and mix the two. • Request extra pretzels, peanuts, and/or snack mix to help build your surplus. If a meal is served later, you can crumble the snacks over the food to improve the flavor and add crunch. • Mixed drinks are one of the few good deals in air travel, because those little liquor bottles contain about one and a half drinks’ worth of alcohol. Be sure to get a full can of whatever mixer you choose, plus an extra cup of ice. This allows you to regulate ratios as the ice melts and the effects of the alcohol set in. A study by Lufthansa determined that when you’re on a plane, your palate is up to 30 percent less sensitive to salty and sweet flavors, largely because the cabin is so dry. Airlines add extra seasoning to counterract this phenomenon, so meals taste better in flight. If you’re packing food for a trip, you should do the same. But you may still find yourself trapped at 35,000 feet with a bland-tasting meal. How best to avoid this cruel fate? Before your voyage, buy some empty, plastic, three-ounce travel bottles meant for shampoo and conditioner. Fill them with soy sauce, honey, curry, sriracha, or whatever potent potables float your boat. Pack them in your carry-on. When dinner time comes you’ll be the envy of the aisle. What if you could make everything you eat more delicious?As creator of the WNYC podcast The Sporkful and host of the Cooking Channel web series You're Eating It Wrong, Dan Pashman is obsessed with doing just that. 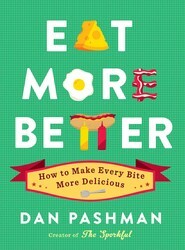 Eat More Better weaves science and humor into a definitive, illustrated guidebook for anyone who loves food. But this book isn’t for foodies. It’s for eaters. Dan Pashman is the creator and host of WNYC’s James Beard Award–nominated food podcast The Sporkful. He’s also the host of the Cooking Channel web series Good to Know and You’re Eating It Wrong and a contributor to NPR, Slate, Buzzfeed, and LA’s KCRW. He lives with his wife and two daughters. Find Dan at Sporkful.com.